Five of my history buff friends visited the State Archives last month and viewed about 15 maps including the 100' Judah map showing in extreme detail the route of the RR over the summit. We also paid a visit to the RR Museum Library in Old Town and found some interesting maps showing CPRR stations in great detail. I was personally looking for more info. on the Dutch Flat Wagon Road. 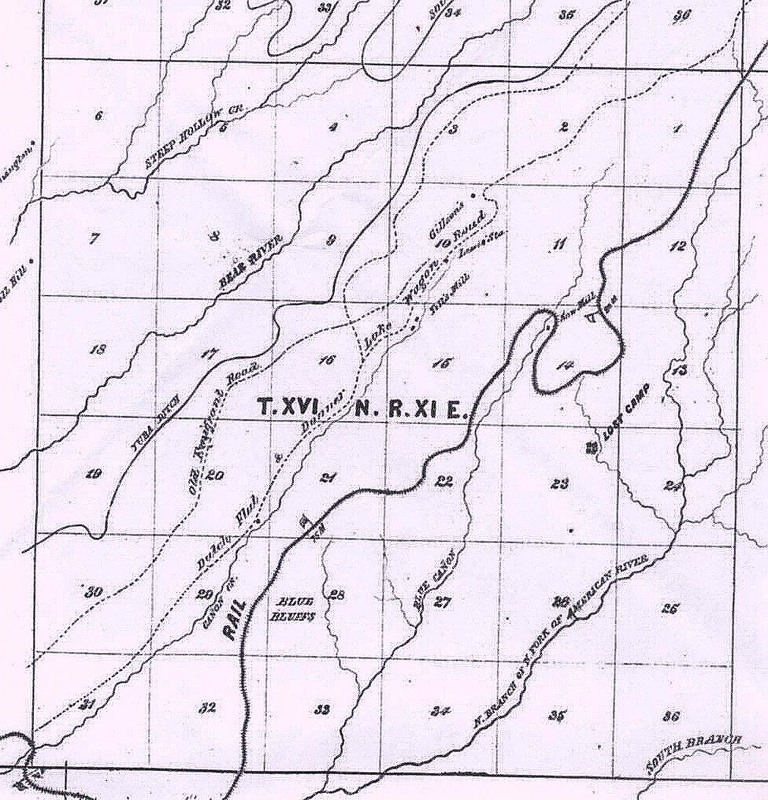 Specifically, I am looking for survey maps that might have been created in 1863-64. I know that R.H. Pratt was the general superintendent of road construction (see my attachments), and I suspect that maps were created because the road was closely associated with the RR. Do you have suggestion on where I might look? I just received from a friend at the Placer County Mapping and Surveying Division a copy of an 1866 map showing the CPRR route as well as the Dutch Flat & Donner Lake Wagon Rd. plus some other roads. This map shows the section of DF-DL WR from Alta to a couple miles west of Kingvale, actually to Troy. I am attaching a scanned section to show the kind of detail the map has. Let me know if this is useful for your project. I can scan the remainder of the road section and send it by email also. If needed, I can try and see if an adjoining sheet of the map is available showing the route to Donner Lake. Here are scans of the remainder of the map insofar as it shows the DFDLWR. The Placer Co. map file reference in the Engineer's Office is R6 49 - Tube 12 Map 6. Hope this is a good enough location to do some good. I will see my friend in about a week and see if he has the adjoining sheet. ... R.H.Pratt was the guy in charge of building the road—he probably had maps created for the project—where are they ? Don't know if you ever chatted with Bud, he was the very best. He is the guy that tracked the map of the SP&N. Thank you for your interest and inquiry regarding the Memorial Services for Bud Uzes. We hope you will understand if we use the electronic E-Mail to contact you. Please go to the Bud Uzes website for information.